What I may lack in care for precision, knife skills, attention to detail and the like in the kitchen (which is certainly a lot), I make up for with a passion and finesse for baked goods. While many cooks, my husband included, argue that baking is less enjoyable due to its demand for accurate measurements and loyalty to the documented recipe, to me there’s something so much more soothing about the step-by-step process that leads to sweetened, chewy, doughy goodness. I find there is still so much room for flavor play and creativity within the boundaries of a recipe. And maybe that’s what I love most – finding freedom within strict limitations (don’t get me started on fancy underwear. Just don’t.). I’ve been making these for over half my life. 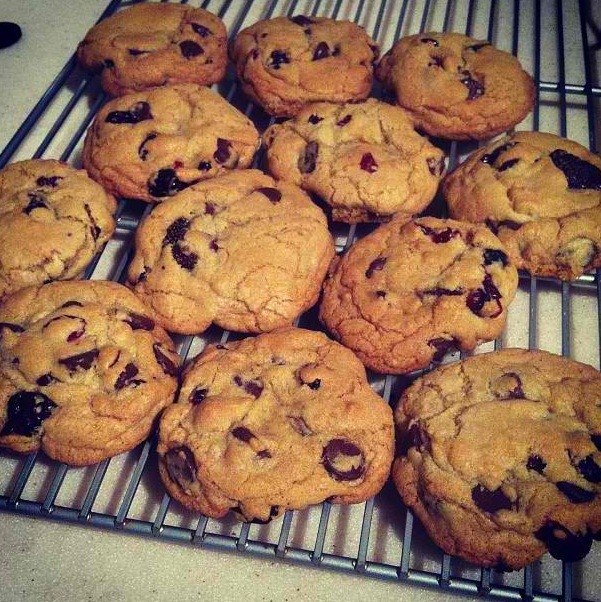 I started baking a standard chocolate chip version of these cookies 16 years ago at age 10. I received a children’s cookbook with pictures of each step for Christmas that year. I wasn’t allowed to bake these alone – I usually left a huge or catastrophic mess in my wake (though, now, 16 years later, that can still be said, and I am always given a brief little lecture by my mom not to leave a mess on her stove when I make jam). It’s hard to believe that through the years – through the big glasses, the braces, the acne, that this recipe – the one from a children’s cookbook has been my go to. In high school that meant having friends over to sit at my parents’ big kitchen island and watch me bake batch after batch and feast on our weight of the dough and the finished product. College meant baking these in a tiny dorm oven 4 at a time, which took hours. And now. Now I make them because they’re part of me. And I still like to eat my weight in dough and the finished product. This time, I decided to jazz the standard version up a little bit with dark chocolate chunks and dried cherries, though, they’re equally exquisite with chocolate chips, peanut butter chips and broken up pieces of salted, crunchy pretzels. And the simple version with semi-sweet chocolate chips are arguably some of the best cookies imaginable. Preheat oven to 375. Combine Crisco, sugar and brown sugar until incorporated. Add in eggs and vanilla, stirring until smooth. Add salt, baking soda and flour. Fold in dark chocolate chunks and dried cherries. Arrange heaping spoonfuls on baking sheets, and bake for 8 1/2 minutes or until light golden brown. Outside should be crisp, and interior should be melted and soft.